Here’s to my Uncle John who died at the age of 94 on Saturday. I wish everyone could have such an uncle. A long-standing English Literature professor, he was a recognized authority on John Ruskin, the Victorian art critic and social thinker. Once while staying at Venice’s La Calcina Pensione, where Ruskin himself had resided for a number of months in 1877, I sent my Uncle John and Aunt Betty a postcard with the silly quip: “Here I am surrounded by The Stones of Venice.” Referring to one of Ruskin’s best-known works, it was a joke I knew that they (at least) would find amusing. And for much of my adult life, that’s the kind of correspondence we had (perhaps a few times a year) and for which I shall be forever grateful. His richly, entertaining letters on the nature of things were “pass around” examples of wit and erudition, which I deeply inhaled. That I was able to even attempt to match them with letters of my own was a tremendous way to advance my writing skills, with the happy benefit of remaining in touch. Yes, he was an authority on Ruskin but his great love (except for my Aunt Betty of course) were the works of Thomas Hardy. One of the great “Naturalistic” writers, who depicted a literary world where one’s heredity and social environment greatly influence one’s character. I guess the same could be said for Uncle John. Born, John Lewis Bradley in London 1917, he attended London’s Highgate School and went on to earn degrees in English Literature at Yale and Harvard. In 1941 he joined the British Naval Intelligence Service, serving in California and New York prior to transferring to the Royal Canadian Air Force in 1943 (the year he and my aunt were married), with numerous sorties over Germany as a Wellington navigator-bombardier beginning in 1944. After receiving his PhD from Yale at war’s end he began to teach, and there he was truly in his element, working his way up to full professorship (and a Guggenheim Fellowship) with years spent at: Wellesley, Western Reserve, University of Maryland, Clark University, Mount Holyoke, Ohio State, University of South Carolina and eventually Durham University back in England, where he chaired the English Department. 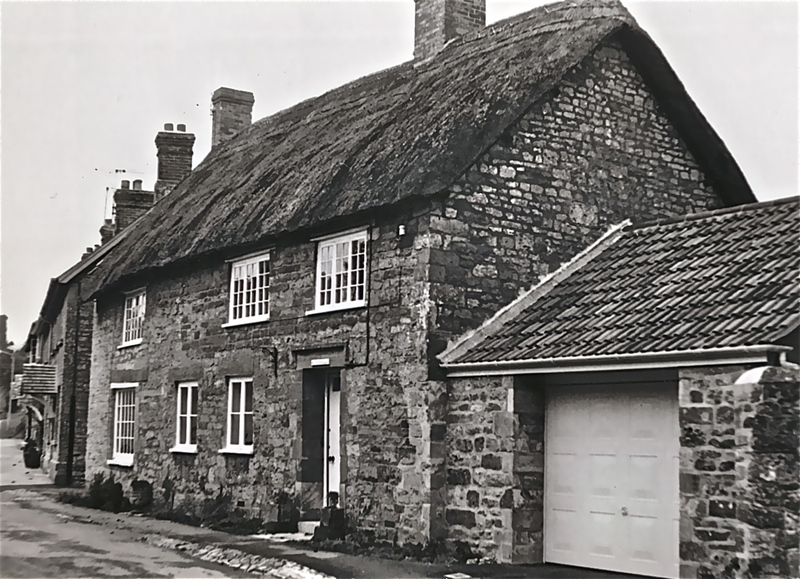 Church Cottage, Hinton St. George (taken during my black & white phase) was a delightful place to visit. If like me you’re one to leap ahead, you’ve no doubt figured out today’s selection and I expect you’re wondering what “Animal Crackers in My Soup” (hardly a “Naturalistic” classic) has to do with such a man as John Bradley. Well, with lyrics by Irving Caeser and Ted Koehler and music by Ray Henderson, it was introduced to the world by Shirley Temple in the 1935 film “Curly Top” and the man holding the baton as musical director was none other than Uncle John’s father, Oscar Hambleton Bradley. As I see it, if even in a very small way, this silly song (and others like it) helped to finance an education that sparked a decidedly precious enthusiasm for literature, language, music and especially for teaching. And that enthusiasm stands out as a singular rivulet in my own life’s edification. I’ll say it again. I wish everyone could have such an uncle.